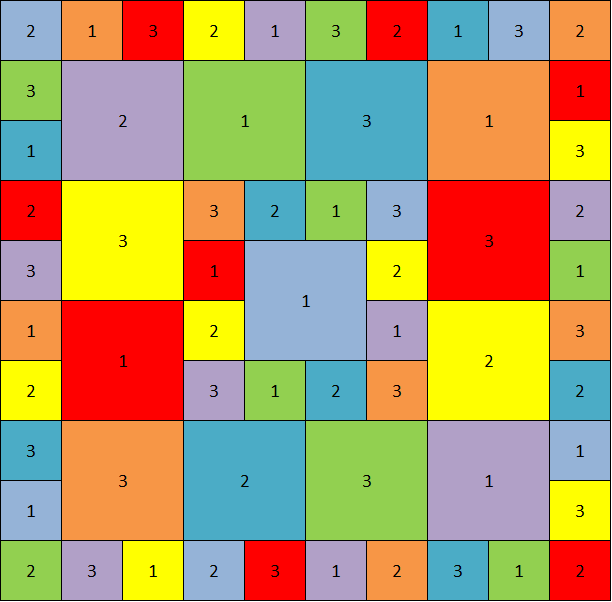 Here is square number 6, it’s a large version of square number 2, so you should be able to complete it with ease. The pattern is written in English crochet terms. Round 1: 5ch (counts as 1tr, 2ch), (1tr, 1ch, 1tr, 2ch) 3 times into the ring, (1tr, 1ch) into the ring, join to 3rd st of starting 5ch with a ss. Round 2: ss into 2ch-sp, (note for this and each subsequent round: this ss is to position the start of the round in the right place) 5ch (counts as 1tr, 2ch), (2tr, 1ch) into the same 2ch-sp, *(1tr, 1ch) into next 1ch-sp, (2tr, 2ch, 2tr, 1ch) into the next 2ch-sp; repeat from * another 2 times, (1tr, 1ch) into next 1ch-sp, 1tr into first 2ch-sp, join to 3rd st of starting 5ch with a ss. Round 3: ss into 2ch-sp, 5ch (counts as 1tr, 2ch), 2tr into the same 2ch-sp, *(1tr, 1ch) in next st, (1tr, 1ch) in each of next two 1ch-sps, miss 1 st, 1tr in next st**, (2tr, 2ch, 2tr) in next 2ch-sp; repeat from * another 3 times but on the last repeat finish at **, 1tr into the first 2ch-sp, join to 3rd st of starting 5ch with a ss. Round 4: ss into 2ch-sp, 5ch (counts as 1tr, 2ch), 2tr into the same 2ch-sp, *1tr in next st, (1tr, 1ch) in next st, (1tr, 1ch) in each of next three 1ch-sps, miss 1 st, 1tr in each of next 2 sts**, (2tr, 2ch, 2tr) in next 2ch-sp; repeat from * another 3 times but on the last repeat finish at **, 1tr into the first 2ch-sp, join to 3rd st of starting 5ch with a ss. Round 5: ss into 2ch-sp, 5ch (counts as 1tr, 2ch), 2tr into the same 2ch-sp, *1tr in each of next 2 sts, (1tr, 1ch) in next st, (1tr, 1ch) in each of next four 1ch-sps, miss 1 st, 1tr in each of next 3 sts**, (2tr, 2ch, 2tr) in next 2ch-sp; repeat from * another 3 times but on the last repeat finish at **, 1tr into the first 2ch-sp, join to 3rd st of starting 5ch with a ss. Round 6: ss into 2ch-sp, 5ch (counts as 1tr, 2ch), 2tr into the same 2ch-sp, *1tr in each of next 3 sts, (1tr, 1ch) in next st, (1tr, 1ch) in each of next five 1ch-sps, miss 1 st, 1tr in each of next 4 sts**, (2tr, 2ch, 2tr) in next 2ch-sp; repeat from * another 3 times but on the last repeat finish at **, 1tr into the first 2ch-sp, join to 3rd st of starting 5ch with a ss. Round 7: ss into 2ch-sp, 5ch (counts as 1tr, 2ch), 2tr into the same 2ch-sp, *1tr in each of next 4 sts, (1tr, 1ch) in next st, (1tr, 1ch) in each of next six 1ch-sps, miss 1 st, 1tr in each of next 5 sts**, (2tr, 2ch, 2tr) in next 2ch-sp; repeat from * another 3 times but on the last repeat finish at **, 1tr into the first 2ch-sp, join to 3rd st of starting 5ch with a ss. Round 8: ss into 2ch-sp, 5ch (counts as 1tr, 2ch), 2tr into the same 2ch-sp, 1tr into each st and 1ch-sp around, (2tr, 2ch, 2tr) into each 2ch-sp, and work a final 1tr into the first 2ch-sp, join to 3rd st of starting 5ch with a ss. Break yarn and fasten off, leaving a long tail of about 6m for sewing or crocheting together later. You should have 31tr along each side and a 2ch-sp at each corner. I made 5 of these in varying colours, but you may make as many as you like. However, for the layouts below you will need a total of 48 small squares and 13 large squares. 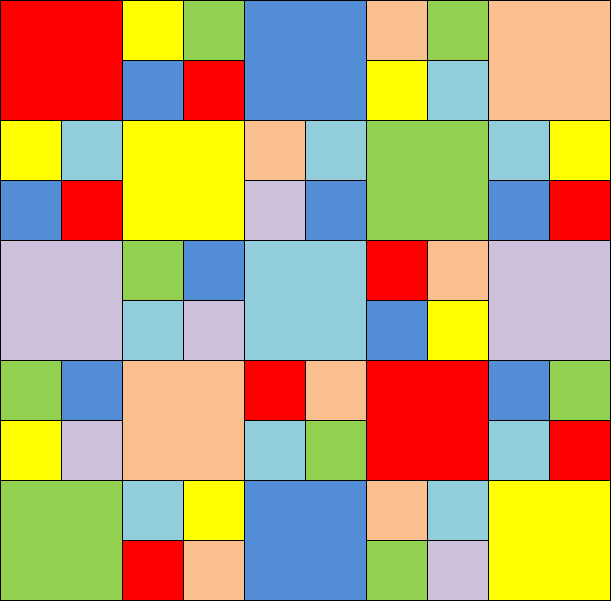 Both these options use the same number of large and small squares. Option 1 is the layout I used, and it includes the colours I used as well as the square numbers. If you choose this option then the best way to join is by sewing or slip stitching together the way I did in the Christmas CAL here. 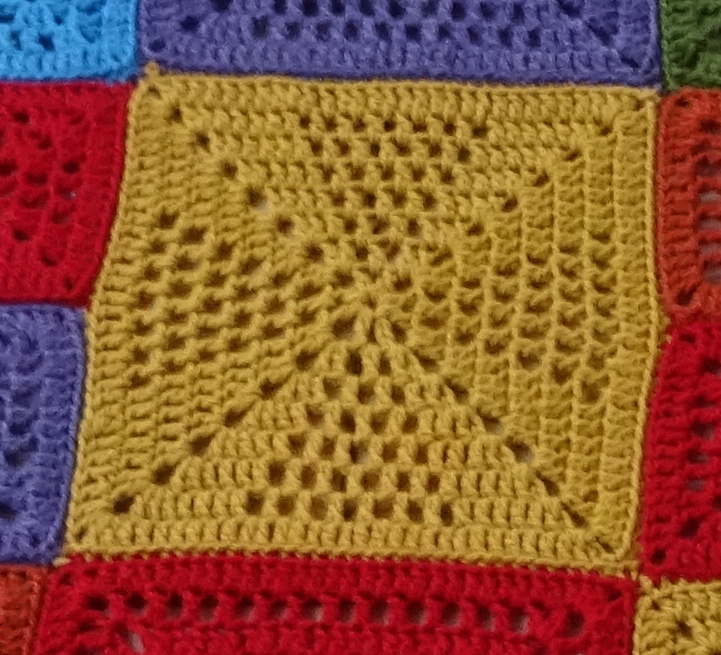 If you try a different join (such as double crocheting together) the width of the joining seam of 2 small squares makes them too big to join neatly against a large square. If you choose option 2 then first join 4 small squares by slip stitch or sewing together and then treat them all as large squares. Using this option you can use more fancy joining – from double crochet to braids. Before you join your squares, have a play with the different colours and patterns until you find a layout/colour scheme you like – it doesn’t have to be the same as mine! As usual please share progress, either here in the comments or on the Ravelry forum here. Tune in soon, for the edging and final reveal!